After graduating from Cardiff Uni., I spent a couple of weekends travelling up to London to audition for various music projects! One weekend I made the trip with my Dad (for company) to London to sit all day waiting to audition at Pineapple Studios, the classic London audition, rehearsal and dance class studio. After waiting all day - as standard with at least hundred other candidates - my time came. Singing audition first, and successful singers were then selected to audition their dancing skills. Quite late in the day the selected vocalists were pulled into the studio room in 2 groups and shown a basic street dance routine and had to learn and copy the routine - much like the dance classes held at the same studios. Then eventually we were whittled down to 3 girls and 3 guys. We were told that the audition was for a 4 piece mixed pop band (2 girls and 2 guys) of which they managers already had 1 girl and 1 guy. So only 1 more girl and guy would make it through to be in the band. The next stage of the audition was in a more relaxed environment. One of the mangers had a lovely country home with decent garden space, in which we all had to turn up to enjoy a barbeque with the existing band members, managers and their families. After a pleasant day, the 6 hopefuls were then told who would be the lucky ones. It turned out that as they liked 2 out of the 3 girls so much that 2 girls and 1 guy were selected to make it a 5 piece mixed band. I was one of those lucky girls! So, there and then, Word On The Street was created. This is all fine, except the first gig was the following Saturday after the audition. So the first week of being a WOTS band member was somewhat hectic. Hair styling, clothes, makeup, photo shoots for promo cards, learning the 2 tracks we would perform, recording them and learning the dance routines for them, all in 5 days. It was pop music, but the manager's idea was that it should be somewhat harder edged than most. Therefore the dance routines were part of what would make this difference, and so there was a lot of rehearsal time needed for the street dance routines we all had to learn. The rest from this point I can say is history. Smash Hits Arena Tour, the T.V. Hits tour, the 911 U.K. Arena tour, the B*Witched U.K. Arena tour, the Nickelodeon Tour, the Live & Kicking Tour, the Disney Channel Tour, and, have performed alongside bands such as Westlife, FIVE, SClub7, STEPS and The Atomic Kittens, in many Summer concerts (Party in the Park, etc). One of the many amazing experiences was performing at Wembley, bouncing onto the stage, vocal ad-libing to thousands of hyped up teenagers!! So many photo shoots, including Lee Jeans modelling. TV and radio interviews, one after the other. 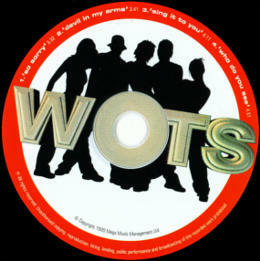 With WOTS, I was part of a multi-record Label Showcase, out of which came a few offers. However they were only for me as a solo singer, the 3 girls as a band, or myself and one of the guys as a duo!!! Unfortunately out of loyalty, our managers never took any of these opportunities!! Tracks from this experience can be found on the Music Page. Sammy was an all rounder, musical theatre was her thing! Becki was a mean dancer, and kept us all together through the routines. Jon-Sel was the Ladies man of the band, as well as being a complete personality on stage - he got the crowd going! Leighton was the front man, and knew how to speak to a crowd. He also booked most of the gigs for the band. Leighton was later replaced by Paul - who was like Sammy an all rounder, but his dancing was definitely his forte! Well I guess I was the lead singer of the band. Although we all did backing vocals and had our vocals on each of the tracks somewhere, I did the majority of the leads.